For her tireless efforts to improve the health of seniors, Joy Plein received this year's UW-UWRA Distinguished Retiree Excellence in Community Service Award. Joy Plein, ’51, ’57, has always been a dynamo and retirement hasn’t changed that one little bit. 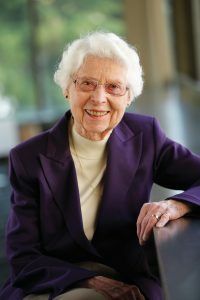 At the age of 91, she continues to serve the community, supporting UW pharmacy students who are training specifically to improve the health of seniors who live in retirement communities. The Distinguished Retiree Excellence in Community Service Award is based on an individual’s post-career contributions to the UW community, as well as to communities around the country and the globe. Since Plein retired in 1994 after serving 28 years as a professor of pharmacy, she has served on 12 committees and boards that focus on quality of life for older adults. There’s just no slowing her down. You can read more about Plein on her School of Pharmacy page. Learn more about the award she won from UWRA.